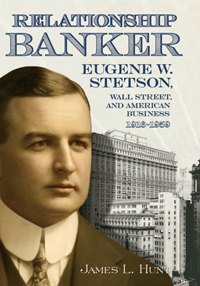 In 1916, Eugene W. Stetson, a thirty-five year old banker from Macon, Georgia, became a vice-president with the Guaranty Trust Company of New York, a “Morgan Bank.” Although by this time Pierpont Morgan was dead, Guaranty still resided fully within the Morgan firm’s orbit, its broader policies controlled by the votes of Morgan partners. Stetson took full advantage of the Guaranty-Morgan opportunity. Between 1916 and his death in 1959, he became president and chairman of Guaranty. He survived the booms and busts of World War I and its aftermath, the stock-crazed 1920s, the transformation of banking in the Depression, and the demands of total war in the 1940s. In 1958, Stetson spearheaded the merger of Guaranty and Morgan, beginning a long series of combinations that eventually produced JPMorgan Chase, currently the largest bank in the United States. Throughout these events, the key to Stetson’s banking—as well as the key to the larger question of who got capital—was Stetson’s skill at creating and sustaining personal relationships. His best clients and associates included Coca-Cola’s Robert Woodruff, financier and railroad baron Averell Harriman, IBM’s Tom Watson, Sr., and Morgan’s Thomas Lamont. It is through these relationships that both Stetson and Wall Street banking in the middle decades of the twentieth century can be understood. By focusing on Stetson’s career, this study offers a personalized portrait of the strategies and relationships that determined who received capital in twentiethcentury America.